Nordeuropäische Unternehmen geben einen weniger optimistischen Ausblick für das chinesische Wirtschaftsklima. Das ist das Ergebnis des China Financial Index für September, der im Vergleich zum Februar um 5,5 Punkte auf 57,1 fiel. Zuletzt gaben Wirtschaftsdaten aus China Anlass zur Sorge. Das BIP liegt bei knapp 7 %, Exporte gingen im Vergleich zum August 2014 um 6,1 % zurück, Importe um 14,3 %. Hinzu kam der Einbruch des chinesischen Aktienmarktes, der Finanzmärkte weltweit in Schrecken versetzt hat. "One third of our clients say that they saw declining sales in the first six months. That is a worrying sign that cannot be ignored. However, it is not really anything we didn't know already. Industrial companies in China have seen a decline coming for quite some time and many of them are acting in segments of the Chinese's economy that don't seem to grow at the moment." 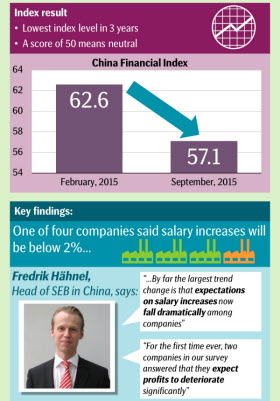 so Fredrik Hähnel, Head of SEB in China und Autor des Reports. Dennoch liegt das Wirtschaftswachstum Chinas im internationalen Vergleich weit vor den europäischen Industrieländern. "The fact remains that over half of our clients said their sales increased this year and almost as many expect the order books to develop well for the remainder of the year. The golden years of rapid growth may be over for certain industrial companies in China. But for a very large number of companies selling consumer goods, professional services, medical equipment etc. sales seem to hold up well and if anything, these companies will be investing more in China. ".